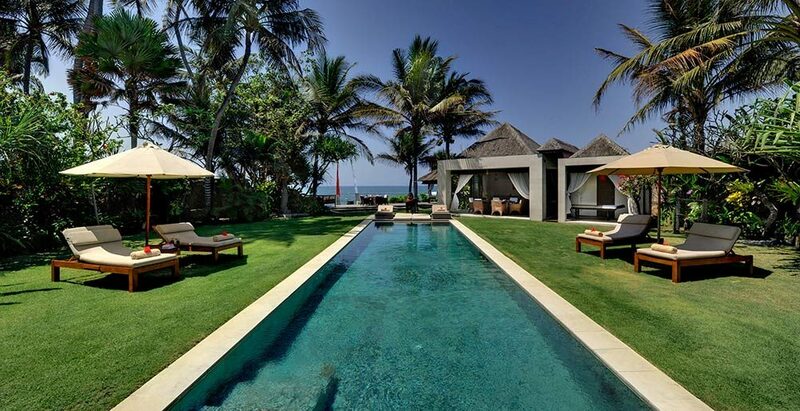 Welcome to Majapahit Villas, an enclave of three beach front villas located on Bali’s southeast coast with landscaping and contemporary architecture inspired by the ancient Javanese Majapahit Empire. The four-bedroom, absolutely beach front Villa Maya, and the three-bedroom Villa Nataraja and Villa Raj are all similar in layout with large and comfortable bedrooms, private walled gardens complete with private swimming pools, indoor jacuzzis, massage pavilions and relaxation balé, whilst sophisticated decor, old photographs and a generous smattering of tribal objets d’art fill the villas with the wonderment of the East Indies. Where the villas differ from each other is that Villa Maya has a larger garden and sits on the water’s edge, offering stunning views of the sea and offshore islands. 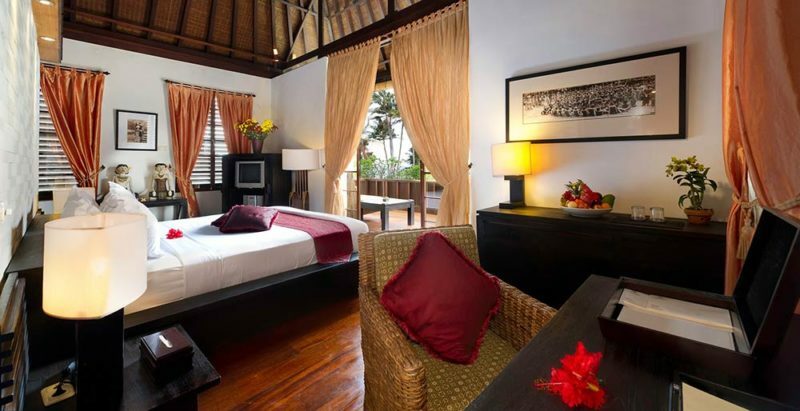 An adjoining door also connects it to a traditional Javanese, one-bedroom wooden joglo (also on the water’s edge) which has been renovated to the highest levels of comfort with honeymooners and romance in mind. With its own pool and a large lawn area and Hindu Temple, you would be hard pressed to find a more romantic wedding venue on the island. 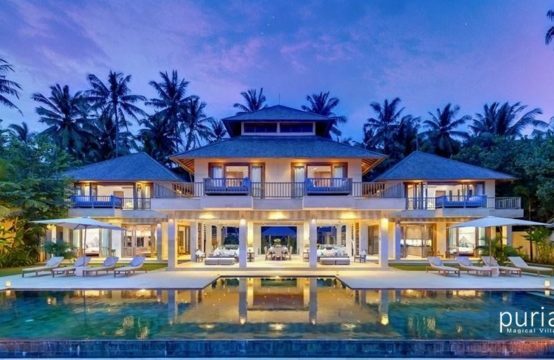 And while Villas Raj and Nataraja are set slightly back from the water, they offer sea views from the upstairs balconies, and have shared access to a seaside relaxation deck so they can take full advantage of the views from the water’s edge. 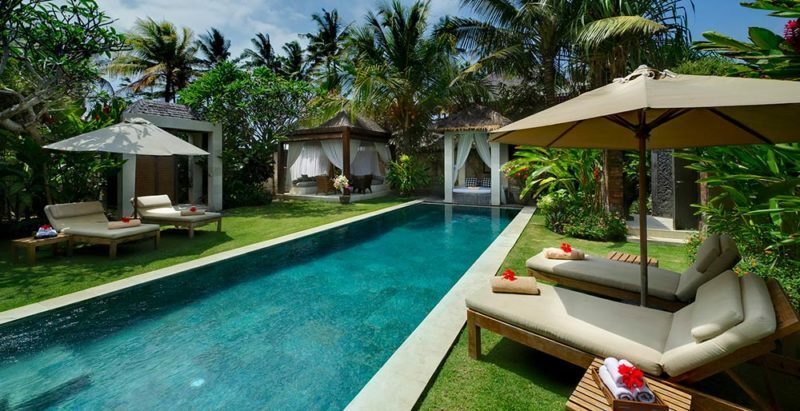 Within the Majapahit Villas complex is a boutique which sells traditional handicrafts, clothes, beachwear, sarongs and silver; all reflecting the same exquisite style and taste that you will find in the villas. This is the perfect place to browse for that little piece of Bali (and Majapahit) to take home for yourself – or for your friends and family. Service is something we pride ourselves on and guests can enjoy relaxed indoor and outdoor gourmet living with personal butler service, superb cuisine and a level of sophistication that even top hotels strive to provide. Weddings are our specialty and with a combined total of 10 rooms on offer (plus extra beds for children), many of your most important guests can all be housed in the one location, making the happy event even more special. The glistening black sands along this remote stretch of coastline are popular only with surfers and local residents, meaning privacy is a given. 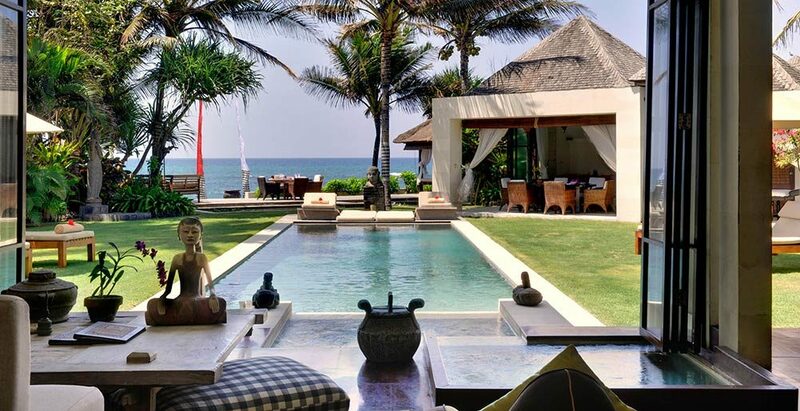 Yet if you do feel the need to venture further afield, then restaurants and shops galore can be found in nearby Sanur, and the villas are only a scenic 19km from Ubud, Bali’s cultural capital. Villa Maya’s main living and dining room welcomes in the outdoors – and even a section of the swimming pool-via folding glass doors. This eclectic fan-cooled space is outfitted with comfy chairs, a satellite-channel TV and a formal dining table for six alongside a pond filled with fat happy koi fish. 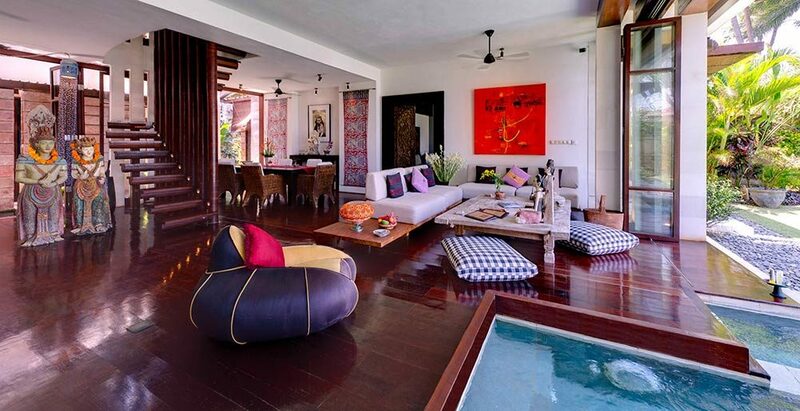 The room is completed with artwork, antique carvings, two ornately carved doors and a funky floating staircase spiralling up to the master suite. At the front of the garden is a charming living and dining pavilion, open on three sides but protected from the elements on the seaward side by sliding glass doors. A deeply cushioned daybed runs along the back wall, and two circular tables at the front offer a more casual dining option. Colourful beaded lanterns hang from the high roof, and the picture is completed with soft white drapes and a tablescape of traditional artefacts. With its 14-metre swimming pool, double jacuzzi, sundeck and spa pavilion, Villa Maya’s gorgeous garden is bordered by towering coconut palms, pandanas, fragrant frangipanis and flowering shrubs. At the end of the garden, a large timber deck rests upon a beachside bluff with steps leading down to the black-sand beach. Furnished with a daybed, a balé relaxation pavilion and an alfresco dining table, this is a place to enjoy the cool breezes, afternoon tea, a cocktail, or even breakfast or dinner beneath the coconut trees while gazing at an awe-inspiring picture of the ocean waves, the coastline or the night sky. The open-sided living and dining space at the joglo welcomes guests with cool sea breezes and a dining table for six overlooking the garden, the pool and the sea. 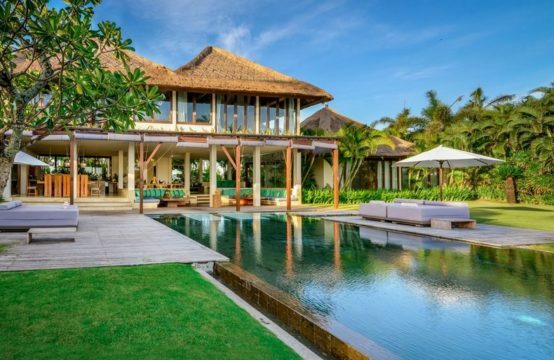 A precious feature is the richly carved centrepiece within the soaring trapezium-shaped roof, beneath which a huge daybed filled with cushions presents a wonderful spot for lazing while being lulled by the sound of the surf. Additionally, an integrated kitchenette offers simple facilities for guests who choose to cook. 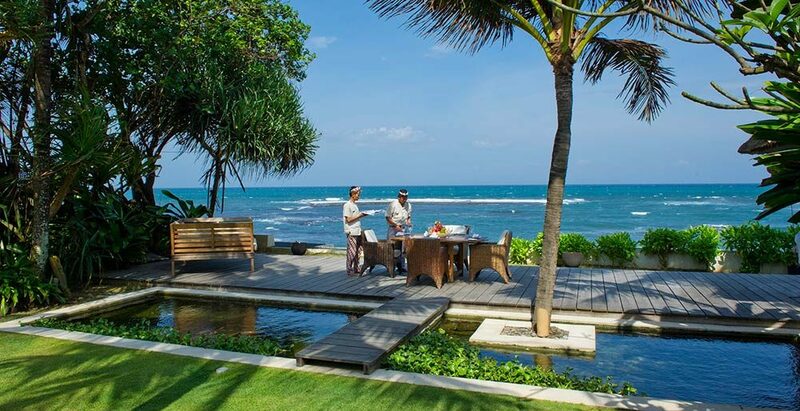 The joglo’s garden introduces a private 8-metre swimming pool, a large lawn bordered by brightly coloured tropical plants, frangipani trees, and a mesmerising vista across the sea. Balinese statues and orchids hug the garden walls and a temple rests to one side. 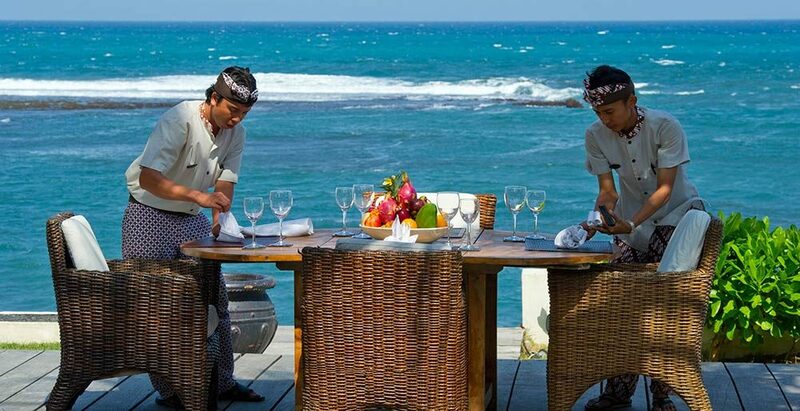 In front of the temple is a large, elevated beachside deck – an enchanting spot for a truly romantic wedding ceremony. Beyond the deck, steps lead down to the sand. 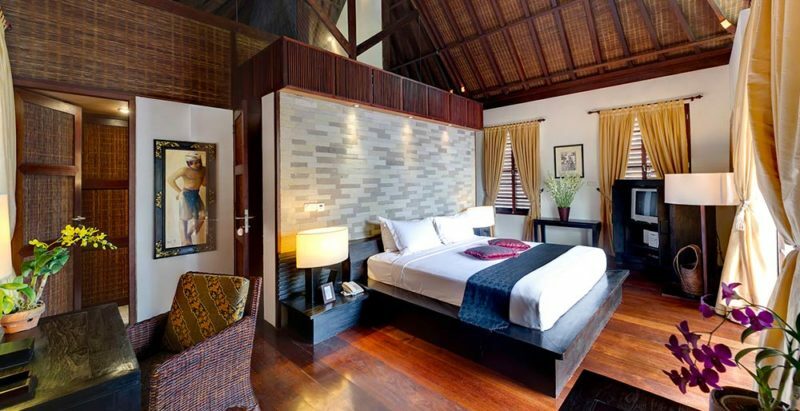 The opulent, air-conditioned, upper-floor master suite is regally decked out in dark woods and rich fabrics with a king-size bed and framed photos from Bali’s golden age. Sliding glass doors lead to a wide, shaded balcony overlooking the pool and with glimpses of the ocean accompanied by the sound of the pounding surf. The ensuite bathroom consists of two sumptuous areas – one with a bath, shower and twin basins, the other with WC and washbasin – linked by a timber walkway and enclosed with attractive fretwork screens. Villa Raj’s main living and dining room welcomes in the outdoors – and even a section of the swimming pool-via folding glass doors. 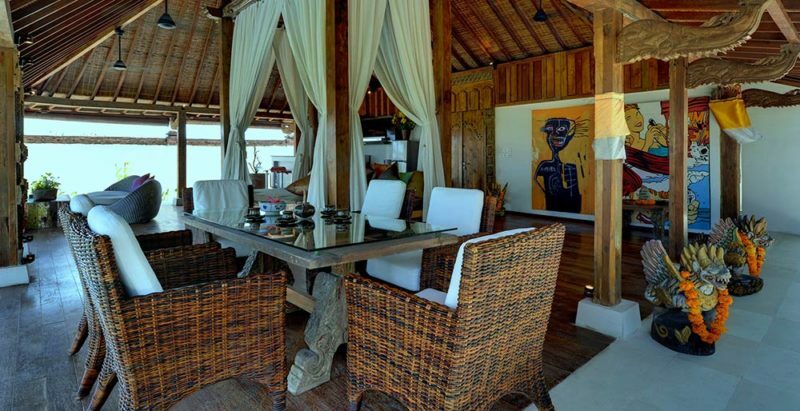 This is the social hub of the villa; fan cooled and outfitted with comfy chairs, a flat screen satellite TV, and a dining table for six alongside a pond filled with fat happy koi fish. The room is completed with artwork, antique carvings, two ornately carved doors and a funky open staircase spiralling up to the master suite. With its private, 12-metre swimming pool, double jacuzzi, dedicated massage pavilion, sun loungers and large relaxation gazebo fitted with cushioned seating and hung with billowing white drapes, Villa Raj’s garden has something to please everyone. A walled pathway leads to a 13-metre-wide timber deck with steps leading down to the black-sand beach. 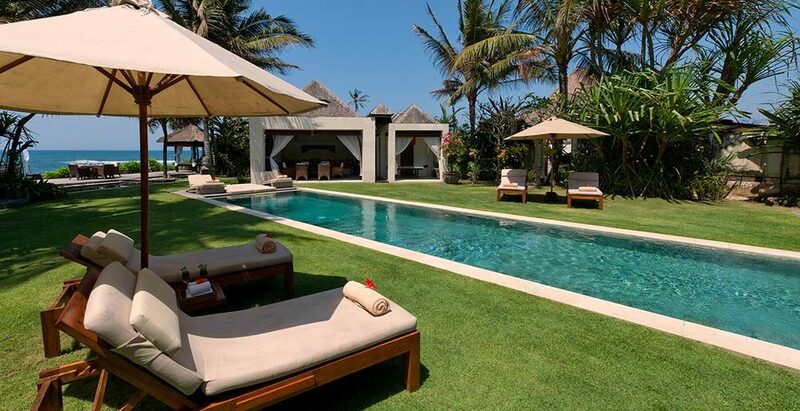 This area is shared with guests staying at neighbouring Villa Nataraja, and is a place to chill out within a thatch-roofed balé or on a large wooden sofa beneath the tall coconut palms and gaze at the awesome view of Bali’s south-east coastline and Nusa Penida Island. 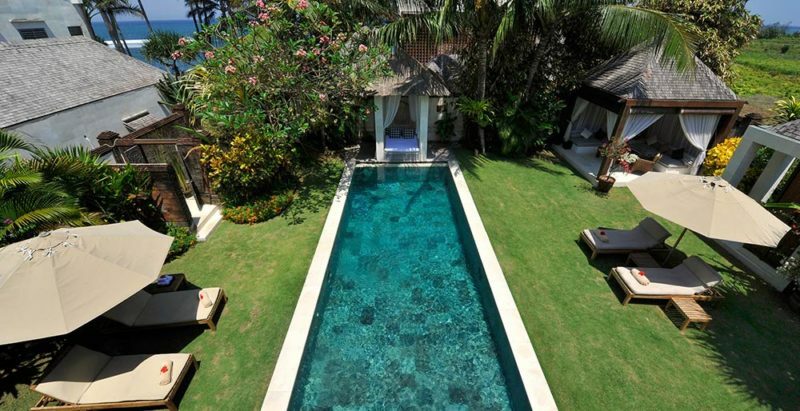 Each villa of Majapahit Villas has its own large pool and two jacuzzis. 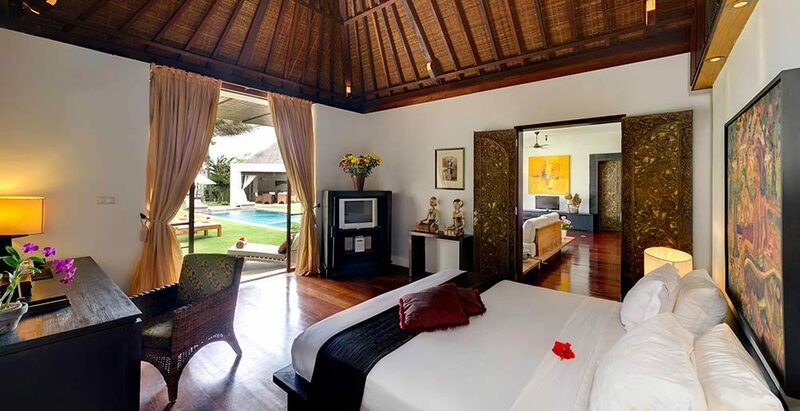 The joglo house at Villa Maya also features an 8 x 2.6m plunge pool. 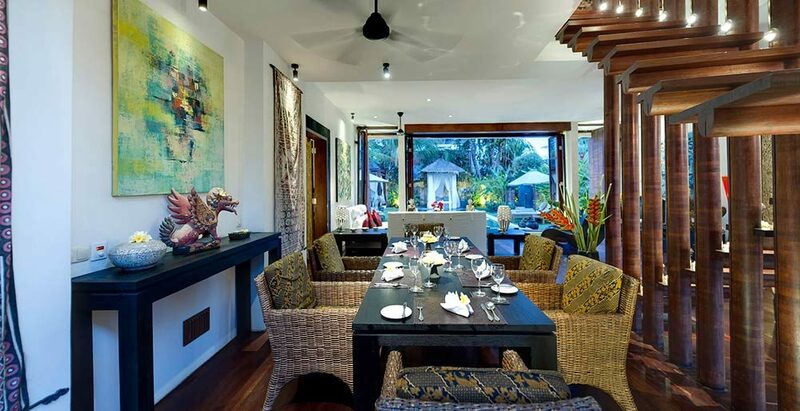 Majapahit Villas accomplished chef, experienced in fine-dining and entertaining, with wide repertoire of international and Asian dishes from healthy to decadent. 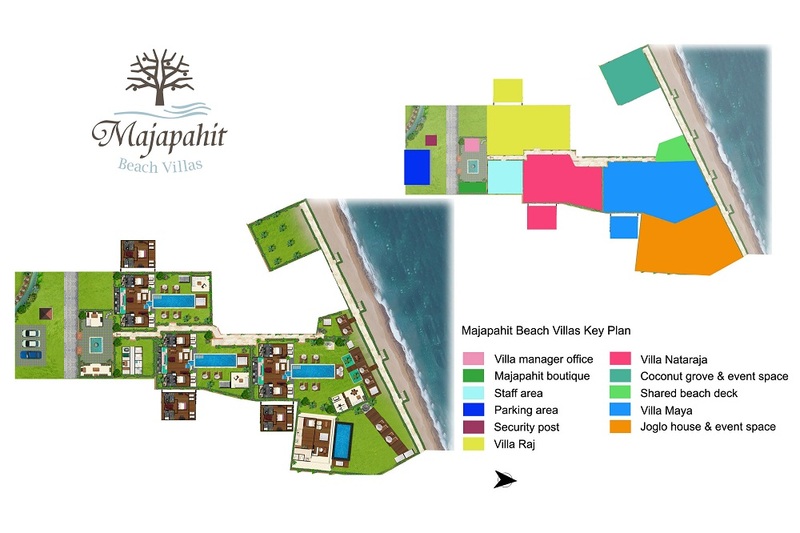 The Majapahit Villas are well equipped for families. Facilities include cots, high chairs, pool toys and children’s DVDs. A 7-seater car and driver is available for up to 8 hours per day at a charge of US$25++ (excludes petrol).